According to Meredith Watassek, Director of Career and Technical Education at Fort Bend Independent School District, “A sustainable workforce starts by educating the middle and high school student and their parents and counselors to the viable career options in construction and other career and technical trades.” Construction Career Collaborative and our Accredited Employers realize that Meredith is absolutely correct. 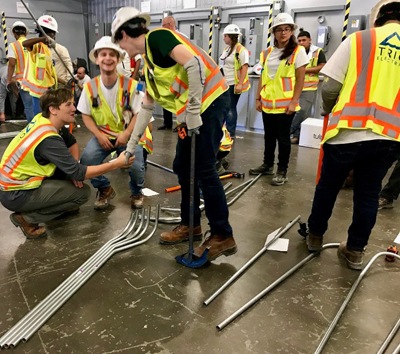 It has motivated C3 companies, Vaughn Construction and TRIO Electric, to create programs that bring high school students to construction sites in Houston to experience the industry first hand while working a summer job. TRIO, a specialty contractor, and Vaughn, a general contractor, have different needs and have designed different programs but each one has the intended outcome of creating more interest and enthusiasm in young workers for a career in the commercial construction industry. C3 companies are working had to create opportunities in our industry that advance all of us. To learn more about exciting work taking place to connect high school CTE programs with C3 companies or to join the journey toward creating an image of construction as safe, skilled and sustainable career option, contact Angela at angela@constructioncareercollaborative.org  or 713.999.1032. Be part of the solution. C3 is how.